Newsgur India: A scam out of this world! A scam out of this world! The duo had made for years a fortune based on scams. According to the Indian police, both were arrested while trying to sell a fake space suit for billions of rupees. The arrest was made after a local businessman was sued by the couple to pay an advance of 14.3 million rupees, equivalent to 178.000 euros. The images of the scammers wearing astronaut suits have become viral in social networks, the police od the Indian capital shared the photos and videos of both citizens. The defendants were on bail for another scam in wich they sold snakes with medicinal properties wirth more than 20,000 euros. The 'modus operandi' was to coax the victims with the idea of working on a device that could generate lightning energy. According to published local media, this time the couple of professional swindlers promised to sell space suits to NASA and the Indian Space Agency, for nothing more and nothing less than 4,690 million euros. Police chief, Alok Kumar, told inernational press that at least thirty people from other Indian states, such as the northen uttar Pradesh and Uttarakhand, are victims of the couple; who have been identified as Virender Mohan Brar, 56, and his son Nitin Mohan Brar, 30. These men boasted of all the money that they obtainded withe their scams and they traveled in luxury cars with armed private security. In addition, they awned a laptop, a printer, they controlled foreigners ans false identity cards, among other elements. According to the police, the scammers also sold copper plates, anti-radiation suits and anti-chemical radiation stickers. 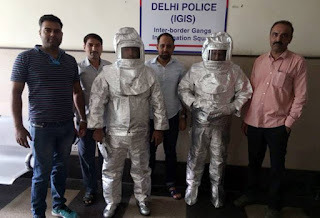 Relating to the space suit scam, the police discovered that the complainant had paid10,800 euros for an anti-radiation suit that, in the words of the criminals, would be used by scientists during their investigations. To convince him, they hired actors to pose as agents of the Government's Military Research department, with the aim if demonstratinf the authenticity of the product. Diaries from India published part of both criminals' story. They were owners of a mechanical workshop in the capital that began to have losses since the 1990s. For that reason, both became scammers and duped their victims with all kinds of rares sales; including magic mirrors and two-headed snakes.